I just returned from the "Happiest Place on Earth" (aka Disneyworld), and I'd love to share some trip highlights with you. First I'll tell you what my hopes were for our family vacation, and then I'll tell you how the reality measured up. Reality: Unable to find a chair near the pool and have to hunt down an umbrella and wrangle it across the concrete. My husband and I play "musical pools," switching back and forth between the kiddie pool and the big pool... trying to make sure all 4 kids are accounted for, and at the same time, trying to keep an eye on our camera and valuables under the umbrella. My oldest two decide to play hide-and-seek in the pool area and one disappears for almost an hour as we frantically search for him. I lather the sunscreen on everyone every half hour, the baby gets it in his eyes, my oldest gets a sunburn, and I get "creeping crud." You may not be familiar with the crud. I'm not sure that's the scientific term, but that is how my sister and I refer to itchy, red bumps that show up after we've spent any amount of time in the sun. 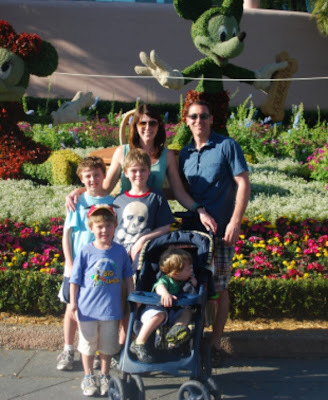 Vacation Dream #2: We'll go to Disneyworld and Universal, eat breakfast with the characters, take some fun family photos, skip through the park, riding fun rides and making happy memories. Reality: Donald Duck is suffering from a broken beak at the hands of my 2 year old, who kept shoving him and screaming, "NOOOOOO!!!" Our photos involve rabbit ears, silly faces and a crying toddler. We go to the Magic Kingdom with everyone and his brother, sister, mother-in-law, second cousin... you get the point. A woman in line near us says that she has been going to Disney for 20 years, and has never seen it this bad. We can barely walk through the throngs of people. We wait in line at the Pirates of the Carribbean for an hour where a lovely woman behind us uses the "F" word more times than I can count. Another "lovely" family (without fast passes) decides they don't feel like waiting in line with the rest of us, and starts shoving their way passed everyone. A brawl nearly ensues. One of my children, who shall remain nameless, starts to panic while in line for a ride. I bend down to reassure him that it is not scary. He head butts me nods emphatically and nearly breaks my nose. I feel Donald's pain. Every meal is wolfed down at record speed, because no one knows when the youngest will decide he can no longer sit a the table for.one.more.second. We tell the boys 10,582,133 times to keep their hands to themselves and stop fighting. Despite repeated warnings by the folks at Epcot, I choose to believe my husband and kids when they say that Mission: Space doesn't cause any kind of motion sickness. Two seconds into the ride and I am terrified that the breakfast I shoved down may revisit me. While driving back to the hotel after hours at Universal, my oldest says he is going to be sick. We plead with him to try not to until after we get out of the rental car. He's a good boy, and makes it all the way back to the hotel before losing his lunch. And dinner. I worry all night that it's the stomach flu and that everyone will be ill on the plane ride home. Luckily, it must have been motion sickness. Vacation Dream #3: We'll time the plane rides to coincide with the youngest's naptime. The lull of the plane will put him to sleep, and he'll be bright-eyed and bushy-tailed when we arrive. Reality: There is no "lulling to sleep." There is no sleep. No sleep turns into hysteria. Two year old has a complete and utter meltdown with an hour left in the flight. The chick from the Exorcist has nothing on him. He acts positively possessed, slapping, kicking, pinching me and screaming "All Done" in a voice I do not recognize. It is terrifying, frustrating, and it doesn't win us any friends. My husband and I swear to each other that we will not set foot on a plane with him until he is at least 4 years old. So, I'm back from vacation. My skin itches, my nose is sore, and every bone in my body is tired. Isn't that what family vacations are all about?? Not to worry... by the time we plan our next getaway, all of this will be a distant memory, and I'll be dreaming about my chair under a palm tree and a fruity cocktail in my hand. Thank heaven vacations are like childbirth and the bad parts get a little hazy with time so we embark on them over again. We didn't leave home until the youngest was 3 and even that was a challenge. So funny..man could I relate and did this resonate with me. BUT I will tell you (actually more like admit to you) now that my kids are older, I this is a little embarrasing..but I cry at the new Disney commercials..EVERY SINGLE TIME. Between that music and the kids reactions to going...that magical moment that they find out (when they are still innocent and not jaded as though you are doing THEM a huge favor) I soooo miss it!! My youngest is 15 and I am 45 and feel too young to not have a "little one" any more..its soo sad. No one to take to Disney anymore though in some ways though hes such a man in many ways hes still a little boy and we may be in that area next month and my hunch is he would be very excited to go to Universal not so much Disney anymore. Your "reality" version was hiliarious and so on the mark. Enjoy the memories while you are making them..they really do go fast! Oh my stars that is so funny!!! I found my way over from Kim's at Southern Savvy and I am so glad I did. I loved your bathroom makeover, but you had me with the vacation story! We visited Disney at Christmas time and had a wonderful time! Now granted... we only have one to keep up with and we were there during their "down" time except for the last day there it was relatively uncrowded. Now you hate me. Right? I loved your story and am a new follower! Such a funny post!! Thanx for sharing the real world of vacationing with kiddos! !